According to Statistics Finland's preliminary data, prices of old dwellings in housing companies rose in the whole country by 1.8 per cent in the second quarter of 2018 from the previous quarter. In Greater Helsinki, as well as in the rest of Finland, prices rose by 1.8 per cent. Compared with the corresponding period of 2017, prices rose by 0.8 per cent in the whole country. In Greater Helsinki, prices went up by 2.7 per cent, while in the rest of Finland they went down by 0.9 per cent. In April to June, the average price per square metre of an old dwelling in a housing company was EUR 2,098 in the whole country, EUR 3,673 in Greater Helsinki and EUR 1,629 elsewhere in the country. Prices of new dwellings in blocks of flats and terraced houses grew by 3.1 per cent in the whole country compared with the previous quarter. In Greater Helsinki, prices went up by 2.2 per cent and in the rest of the country by 3.6 per cent. Compared with the same period in 2017, prices of new units in housing companies fell by 0.4 per cent in the whole country. Prices went down by 3.7 per cent in Greater Helsinki, while in the rest of Finland they went up by 1.5 per cent. The average price per square metre of new units in housing companies was EUR 3,722 in the whole country, EUR 4,920 in Greater Helsinki and EUR 3,300 in the rest of the country. According to Statistics Finland’s preliminary data, prices of dwellings in old blocks of flats and terraced houses went down by 0.4 per cent in the whole country from May to June. 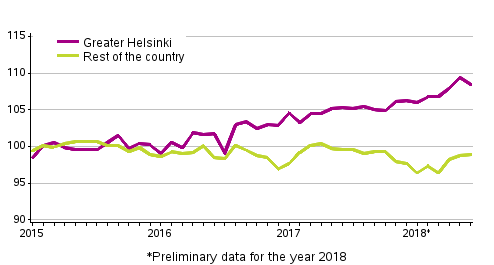 In Greater Helsinki, prices fell by 0.9 per cent while in the rest of Finland they remained nearly unchanged. Compared with June 2017, prices grew by 1.1 per cent in the whole country. In Greater Helsinki, prices went up by 2.9 per cent, while in the rest of Finland they went down by 0.7 per cent. In June 2018, the average price per square metre of an old dwelling in a housing company was EUR 2,122 in the whole country, EUR 3,767 in Greater Helsinki and EUR 1,638 elsewhere in the country. ISSN=2323-8801. June 2018. Helsinki: Statistics Finland [referred: 20.4.2019].